A big perk of running for New Balance is that they have a lot of really good shoes, both on and off the trail. The volume of new designs that come out of 20 Guest Street is impressive. They've taken so many risks and done so many experiments over the past 5 years of re-invention, that there's a real precision to specific shoes they're putting out now. Few other shoes have as much dialed in fit, function, and performance in as light a weight as the 1400v2s. The essence of the shoe is, a soft stable yet flexible heal, a dialed in Japanese last, a snug fit, and a firm toe off, all packed into a 6.3 oz (178g) package. To understand this, you've got to try it on. The experience is something like "hmm, these feel pretty light in my hand, ok, *lace it up* nice arch wrap, *walk around* pretty comfy *jog around* WHOA, that's LIGHT!" The upper is built on the NBJ last (New Balance Japanese) that has been constantly perfected to deliver a shaped fit. By shaped, I mean, it's curved precisely around the foot, with the upper sewn in under the foot (see below) to better hug the foot. There's no baggy-ness and no slop between the foot and the sole of the shoe. However, at the same time I find the toe box wide enough to let my foot splay naturally. It's still a precise fit for slicing up single track on the balls of my feel, and it gives me a lot of confidence in any terrain. The fit is improved upon from the 1400v1, and it performs much more like a shoe with a 4mm drop. In fact, I'd argue it's better than most 4mm drop shoes with sloppy uppers (it's a 10mm drop, but it doesn't feel like it) when you're in them. 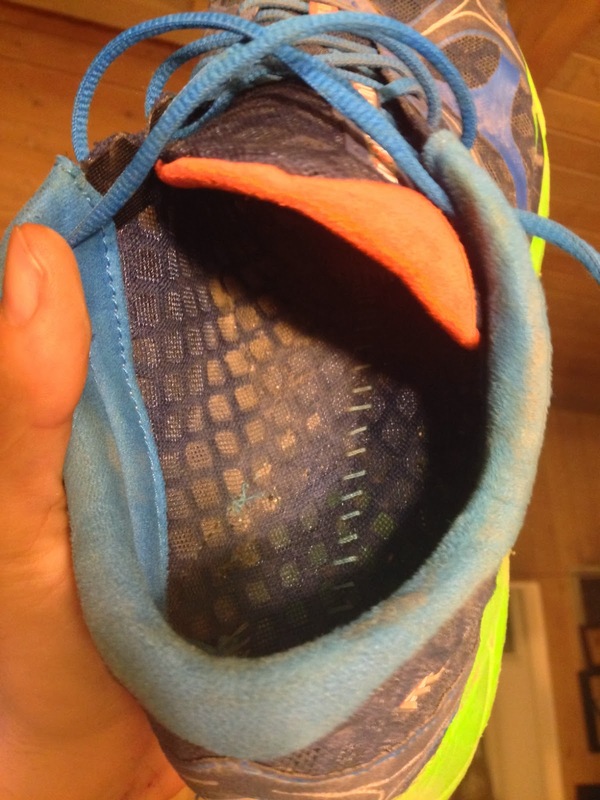 I know many low-drop aficionados have not read my irunfar article on why drop is a relative thing, but I'll still try to explain why this shoe performs like a low drop shoe. Runner's World has tested the shoe in their objective shoe lab for raw data on what's in the shoe. They found that the heel was rated a 98 (meaning, it's softer than 98% of the shoes) and the forefoot is a 17 (meaning it's firmer than 83% of the shoes). So, if you stand in the shoe, you'll sink 81% lower in the heel than in the forefoot. What's the effective drop? I'm estimating 5-6mm, but you have to try it to understand it. If you compare this to the 1400v1's ratings of 80 and 18 on a 11mm drop, you'll see that we're in the same ballpark, but the 10mm drop and the softer heal make this edition's effective drop, significantly lower. Coincidentally, it's the same stack height as the Adidas Adios, which has been worn by many ultra runners over the years (most notably Hal Koerner) except it's an ounce lighter. Sometimes you need stability, sometimes you need flexibility, and sometimes you need cushion. The diamond cutout pattern was kept, and the soul of what makes this shoe so lethal on the trails was kept. In general, most running shoes have a hard time giving runners flexibility, support, and cushion without adding weight and sacrificing one for the other. What the diamond cut out allows, is for medial and lateral cushion on the edge of the foot and arch, while still allowing for torsional flexibility when a technical piece of trail requires it. The diamond shape is a perfect design because it gives limited torsion until the edges collapse on each other and stop. I find it to be a natural extension of my foot while still protecting me in rocky conditions. The rubber seams to wear very well, and is definitely not a weak spot on the shoe after 400 miles. It's not toothy, but it's soft and grips well enough for most trails. As the shoe gets broken in, the forefoot might seem less protected, but it still can handle 30+ mile runs for me. I'll have more info after I race 50 miles in it in a couple weeks. 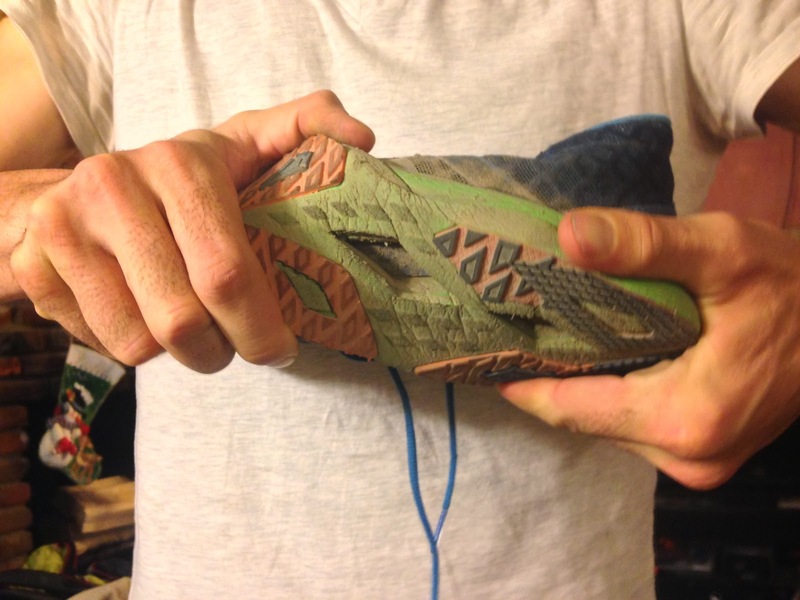 The shoe might run small and feel too snug at first (you might need to size up), but as you break it in, it becomes a perfect, lightweight extension of your foot. The 10mm drop is a lie, because once you put it on, the drop is much lower. The upper is tighter than before, but still seamless and durable. It's not quite a mountain running shoe, but it's very, very fast on trails. For $100, it's much cheaper than the Sense, and worthy of competitive trail runners' time. Thanks for the review, I checked them out in a store and did not like the look of the drop, but since reading your 17/98 explanation I'll check them out again. Have you run much in the mt110s, is there much of a cross over here? Just asking because the 110v2 looks way different to the original. Thanks. I'm having problems with sizing ...on the first version I had to size up to a 10.5, I usually wear 10... But on the v2 the mesh is different and the 10.5 seemed a bit too large but the 10 not too tight but close , should I size up to 10.5 or will the 10 eventually break in to fit perfect? So what's the verdict over 50 miles? Im really thinking about giving these a go. Thanks in advance Dominic. I was pretty thrilled with my first pair, all in all. Took a few runs to get used to the greater heel and stack height on more technical stuff, but I used them for way more than expected. At 375 miles -- probably half of those road, half very rocky trail -- they are definitely still runnable, with decent grip and only a small tear in the upper, but have collapsed a bit on the medial aspect so I try not to use them for anything too long, or use them every day. Still, a great deal and a great shoe.